Trick candles -- If it's windy out and drafts are making it hard to get your backyard firepit or grill started, see if you have any leftover trick birthday candles laying around the house. Though they're designed to be a practical joke, they can actually make a decent fire starter on a windy day. Once the fire is started, just snuff out the candle and save it to use again. Cardboard tubes -- Instead of tossing toilet and paper towel rolls out when the paper is gone, keep them to use to start a fire. Uses scissors to cut the rolls into 1/8" strips, and keep the strips in a little bin next to the fireplace, so you'll have a nice collection ready next time you want to build a fire. You could also use the rolls to make little "logs" for fire starters--tape one end shut, and stuff shredded newspaper inside (the denser you stuff it, the longer it will burn). Then tape up the other side and you've got something that will burn nicely. Egg cartons -- Having trouble getting your charcoal grill going? The next time you've got an empty egg carton, fill the cups with charcoal briquettes and, if you've got it, leftover candle wax. Place the carton in the grill and light it; it'll start up quickly and soon get the rest of the charcoal going. Oranges and lemons -- Yes, fruit can be helpful with starting fires. 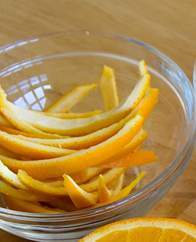 Save the peels whenever you consume an orange or a lemon, because these dried shreds work much better than newspaper for starting a fire (the flammable oils found inside the peel allow them to burn longer). To boot, they smell good and produce less creosote. Looking for ideas to update your fireplace? Tile remains a popular choice, thanks to its versatility. You can use ceramic tiles to create your perfect design in just about any style or historic era. The plethora of different sizes and colors and even shapes available makes the possibilities limitless. Here's an example of a beautiful tile fireplace created by Manet Tiles. 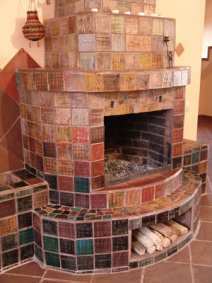 The tiles go beyond just decorating the surround but incorporate the chimney, a backing against the wall, and a firewood holder beneath the firebox. The overall shape is a nice change from the usual boxy fireplace, and the ceramic tiles blend nicely into the pattern on the floor, while still standing out thanks to sprinklings of color. Build a Faux Fireplace -- Speaking of HGTV, here's one of their how to guides. It has a video you can watch. Cardboard Faux Fireplace -- This one doesn't look very real, but it's done with cardboard, so it won't break the bank. That ought to get you started with that fake fireplace. Good luck! Looking for fireplace design ideas? Hearthnet has a gallery of user submitted fireplace pictures. You can browse the pictures online or submit your own at the Heart.net Gallery. It's divided into fireplaces, wood and coal stoves, gas stoves, antique stoves, pellet stoves, and outdoor fireplaces. Ever wonder how fire works? Ok, maybe I'm just an odd one. If you're similarly curious, however, try reading How Stuff Works: How Fire Works and in a related vein How Does a Candle Work? is an interesting read, too. Does a Fireplace Increase Home Value? According to one source, Fireplaces from Everything Real Estate, homes with fireplaces have a higher resale value because they are considered a luxury feature, adding class and sophistication to a home. They recommend: "If you live in a home without a fireplace and are thinking of adding one to improve resale value, the electric fireplace can be a good option because this type of fireplace is often the least expensive to purchase and install." Another article, Will Gas Fireplace add to Home Value, concurred. It suggested the addition of a gas fireplace could add $2500 to the value of a home. Also see Fireplaces Will Help Sell A House for information on the reasons why. "Fires are generally classifed in the US into 4 groups; A, B, C, and D.
Class A: Fires that involve wood, cloth, rubber, paper, and some types of plastics. Class B: Fires that involve gasoline, oil, paint, natural and propane gases, and flammable liquids, gases, and greases. Class C: Fires that involve all the materials found in Class A and B fires, but with the introduction of an electrical appliances, wiring, or other electrically energized objects in the vicinity of the fire. Class D: Fires that involve combustible metals, such as sodium, magnesium, and potassium. (In the UK, Europe & Australasia 6 groups are used)"
The entry has quite a few links to fire-related topics, so check out the whole thing if you're curious. I've always loved fireplaces and campfires, the smell of burning wood and the sound of crackling logs. I remember sitting around a big round gas fireplace in the center of a pizza place as a kid and thinking it was soooo cool. My parents eventually installed not one but two gas fireplaces in their house (alas, I no longer live there, but I do visit). They're not the same as those snapping campfires at the beach, but there's something awfully nice about trundling out to the fireplace in the morning, snapping it on, and warming your buns for a while. The cats like it, too, judging by the fights that take place for the bean bag that resides in front of the fire. Anyway, warm fuzzy memories aside, I thought it'd be fun, and perhaps useful, to create a blog following news, information, and trends related to the world of fireplaces. Gas fireplaces are becoming quite popular, but not everyone knows how to go about getting a good deal on them or having them installed, so that's just a few things this blog will cover. I don't claim to be an expert, so I'll be sure to site sources and give credit where it's due. Thanks for reading, and here's to a cozy evening by the fire!